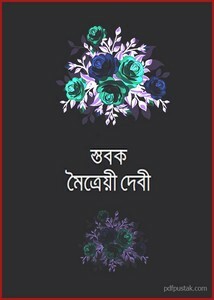 Stabak by Maitreyi Devi poetry book pdf file. Maitreyi Devi (September 1, 1914 - January 9, 1989) was a Bengali poet, writer and novelist. His famous autobiographical novel "N Hanyate" gave him fame. She received Sahitya Akademi Award in 1976 for this novel. In 1977, she was awarded by the India's highest civilian honors 'Padma Shri'. She wrote many poetry books as Udito, Chittochhaya, Eto Rakto Keno etc. Collect a poetry book of her written- Stabak from link below.